Andaman Discoveries, formerly the North Andaman Tsunami Relief, is continuing its work as a social enterprise, seeking to serve the needs of local communities. Through a dedicated network of supporters, volunteers, and donations, NATR successfully implemented over 120 projects in 12 villages by listening to and working with the villagers themselves. All projects have focused on long-term social, economic, and environmental sustainability and creating realistic economic opportunities through training and marketing. The tsunami brought a great number of changes: entire villages were re-located, livelihoods were impacted, and loved ones lost. Inspiringly, many communities created new opportunities from the loss, especially in the area of community-based tourism. Andaman Discoveries is continuing to make this a reality by reaching out to conscientious travelers, making it possible to have a meaningful village experience through exceptional service and comprehensive support materials, like the Visitor’s/Volunteer Guide and Thai Phrasebook. In Ban Talae Nok, half the village was destroyed and 47 of 228 people died. Many lost their homes and means of income, and had no savings. After the basic needs of food and shelter were met, discussions led to livelihood development. 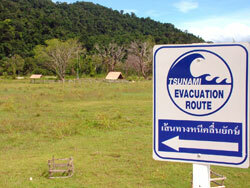 Based on the popularity of nearby Phuket and Khao Lak, communities recognized the potential of tourism. However, many villagers expressed concerns that tourism would undermine and even threaten their culture and undeveloped coastal region. Villagers decided that community-based tourism would allow them to generate additional income and support their traditions, culture, and lifestyle. Community-based tourism could fit into their lives, while not displacing their traditional lifestyles. Community-based tourism requires more than a brief workshop, or simply deciding which houses will serve as homestays and who will be guides. It’s about empowerment — creating a sense of place, identifying what villagers see as important, and using this information to develop tourist activities. As a direct result of these discussions, Andaman Discoveries published and distributed to all villages the “Sense of Place” book, written by 30 villagers from six communities. The book allows villagers to explore, acknowledge and value their cultural identities and surrounding environment. This led to the Sense of Place, Sense of Pride sustainable tourism conference in Phang Nga, led by the villagers and supported by Andaman Discoveries, the Tourism Authority of Thailand (TAT), and Thailand Eco Adventure Tourism Association (TEATA). The conference was attended by government officials, community leaders, locals, and the press. After empowerment, comes education — understanding of responsibilities, creating a common goal, and skill development in all areas, not only those related to tourism. For example, the village coordinator of Ban Tale Nok is running informal education out of the community center to improve adult literary skills. Andaman Discoveries is also managing a long-term scholarship program to provide financial support for underprivileged children to complete high school. The objective of the program was to equip these motivated villagers with the necessary skills so that they could return to their villages and participate in or lead community development and/or tourism. ACE graduate Cha from Ban Talae Nok village is an excellent example of what is possible when given skills and opportunity: she’s become a community coordinator and initiated numerous community-led projects including daily aerobics, waste management, mangrove conservation, and adult education, all using funds directly from tourism. Graduates Chim and Noi, from Tung Nang Dam village, realized the villagers’ need for a floating pier and wrote a proposal for funding, which was successful and also partly funded by money directly from tourism. Other efforts included a CBT Handbook for local guides and homestay-host families accompanied by regular training with staff and volunteers. However, empowerment, education, and training will fail to have any long-term economic, social, or environmental benefit without creating realistic opportunity. Andaman Discoveries realizes the importance of promotion and marketing for the success of tourism and handicraft projects, which led to this website, promotional video, brochures, media coverage, and outreach efforts to create partnerships. Marketing, promotion, and outreach takes money, which is often a barrier to community-based tourism. We have come to the conclusion that we can’t support and provide a service for community-based tourism solely from income from tourism as this would mean an unsustainable number of tourists in the village. Andaman Discoveries is made possible by staff who are motivated by friendship and not profit, as well as outside funding. Andaman Discoveries bridges the gap between the outside world and the villagers in terms of communication and locating funding to make community-led projects possible. 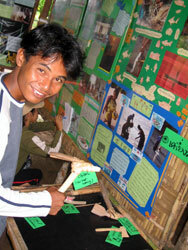 We provide the service and support for a meaningful exchange between the villagers and the tourist. We ensure that the majority of the profit from each village tour goes directly back to the villagers: 20 percent of guests’ in-village costs are donated to the village community fund. This creates concrete economic opportunities for the villagers who may otherwise have to find employment outside the village. This approach allows community-led development and tourism go hand in hand. Andaman Discoveries does not charge the villagers for any of its services, training, or support materials. Andaman Discoveries facilitates community empowerment by providing vocational skills and ensuring that communities benefit directly from tourism. Andaman Discoveries acts as the bridge between communities wanting to participate in tourism and travelers wanting to experience Southern Thailand’s traditional culture and pristine eco-systems. Andaman Discoveries village tours truly engage with the villagers: a translator will accompany you throughout your trip; you can download our comprehensive Thai Phrasebook; and we have a Thai-speaking International support staff. That tourists are willing to spend their time and money to observe their natural environment and traditional ways of life affirms to the communities the importance of preserving these assets. Some of these activities have also created new jobs and revenue for people who previously had no employment. You can also see here how Andaman Discoveries spends its budget. Andaman Discoveries brings responsible tourists and volunteers into the villages to help villagers benefit from the supplementary income from tourism and to reduce the demands on natural resources, including ever-decreasing fish populations. By visiting the village, participating in their traditional ways of life, and exploring the North Andaman’s diverse eco-systems, you help villagers appreciate the importance of preservation and conservation. Villagers are using tourism as a means to express their culture and preserve their environment, which accrues direct value to the whole village by re-investing money back into community-led projects. This understanding also helps keep large scale tourism, which usually exploits the locals and brings environmental degradation, from entering their communities. Before the tsunami, most Andaman Coast communities lived a traditional fishing lifestyle while many young, talented people would leave the region to find work in larger cities. There is very little economic diversity in the area, so as tourism slowly makes its way north from Khao Lak, it presents a real economic opportunity. Unfortunately, this means that the region is being exposed to the threat of large and exploitative tourist developments. There is a danger of local communities being unprepared, both in terms of job skills and cultural resilience that could lead to rapid community and natural degradation. At the Annual Phang Nga Regional Planning Meeting on January 2006, the provincial and national government outlined their plan for regional tourism development. Phang-Nga was chosen as the homestay and eco-tour center, focusing on ‘soft’ tourism and development of small and medium sized businesses. The meeting recognized the expansion of tourism northward from Phuket and Khao Lak, as an opportunity for economic growth without comprise to the area’s outstanding natural beauty and diversity. Andaman Discoveries hopes to support this vision by working with cooperative networks with all stakeholders in the region. Andaman Discoveries and the villagers do not want the region’s traditional culture or eco-systems compromised or threatened by rapid and profit motivated mass tourism.